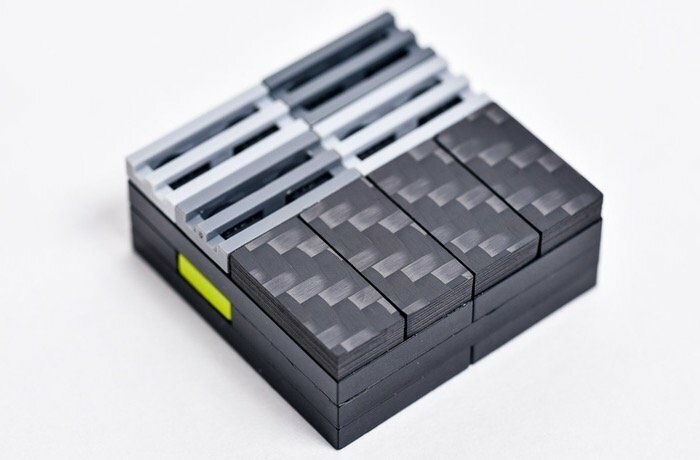 LEGO master builders that are looking for the perfect finishing touch to their creations might be interested in the new range of Lego carbon fiber tiles that have been created by Mark Carpenter in the US. The LEGO carbon fibre tiles are 1×2 tiles and are constructed from 3mm sheets of high gloss carbon fiber. Check out the video below to learn more, all tiles are 3mm tall and machined from sheets of aerospace grade carbon fiber. “My boys (Erickson, Ansel and Ellis) and I love to build, create and tinker with LEGO bricks. As they progressed from simple projects to more complex and elaborate kits, we began to think about what sort of accessory we could create that would be super cool. The result of that thinking are these Carbon Fiber Tiles. Our first task was to find a carbon fiber company that we could partner with. We wanted a team that would give us the advice and guidance we needed and was also excited about the potential of the project. We also had to verify and validate the process, timing, pricing and more. We received the samples in November. Once we held these pieces in our hands and added them to some of our designs – we thought we might have something special. We think you’ll agree that these Carbon Fiber Tiles are brilliant. We have decided to start with the very versatile 1×2 tile. This tile is made from the instantly recognizable gloss black carbon fiber. There are other colors and finishes for carbon fiber that are interesting, but the gloss black version is the classic – the standard. That is the style that instantly is recognized as mad wicked awesome. If the universe of LEGO builders thinks that Carbon Fiber Tiles are good enough to see the light of day – by backing this project – then we will expand the selection of tile sizes and materials. We would start by adding 2×2 and 1×4 tiles in high gloss carbon fiber. We are also sorting out the details of machining tiles from aluminum and stainless steel. The LEGO carbon fibre project is currently over on the Kickstarter crowd funding website looking to raise enough pledges to make the jump from concept to production. So if you think the LEGO carbon fiber is something your projects could benefit from, visit the Kickstarter website now to make a pledge and help LEGO carbon fiber become a reality.